Witness Rajasthani folk musicians performing exclusive songs that were part of a special collaboration with Mumford & Sons and Laura Marling. Join us for a special performance to celebrate Dharohar Project that brought together eight Rajasthani folk musicians from different regional communities from Rajasthan - Dayaram Bhatt, Dilawar Khan, Jumma Khan Mewati, Kutla Khan, Rais Khan Manganiyar, Sardar Khan Langa, and Sumitra Kamad. We will be extending the museum hours for anyone who wishes to explore. This Friday is International Women’s Day, and to celebrate we’re holding an event showcasing incredible female talent from Rajasthan. Sumitra Kamad, an internationally-acclaimed folk singer and songwriter from the village of Jaitaran (Pali), will bless us with the power of her instantly recognisable voice. Sumitra needs little introduction as she has long been a folk emblem and an inspiration for many followers of Rajasthan’s living traditions, having performed in festivals nationally as well as around the world. She was notably an integral part of the “Dharohar Project” where she collaborated with renowned global artists Laura Marling and Mumford & Sons. A symbol for the future of women in Rajasthani folk, we are delighted to welcome her to the RRAP Music Museum & Hub for this very special day. All donations raised from this event will go towards future women-led events and development workshops, establishing our vital commitment to the nourishment of women in folk in Rajasthan and beyond. This event was conceptualised by women, organised by women and will be executed by women. This event is open to all & entry to the event is free. Join us for an evening celebrating with the Holi songs of rural Rajasthan. Nek Mohammed Langa - who’s poignant words line the walls of our RRAP music museum entrance hall - and his folk group will treat us to lively renditions of songs traditionally performed for Holi. Hailing from the famously musically proficient Langa community, this specially curated performance will get you in the right mood for the upcoming festivities. Expect joyous, uplifting melodies and pulsating yet intricate rhythms to make you move. RRAP Jam: Where folk musicians and locals gather in celebration of music and community in an open jam format. This Jam explores Rajasthani sonic textures through a Peruvian lens and the ever growing presence of electronic music in traditional music. It will showcase the Momasar Quintet: Bhungar Khan Manganiyar, Nehru Khan Manganiyar, Bhutta Khan Manganiyar, Majoor Khan Manganiyar and Latif Khan Manganiyar and Indie electronic artists: Lakhya Sharma and Mohak Arya from Prologue Sounds . Music producer Tomas Diaz Limaco will be conducting the jam. 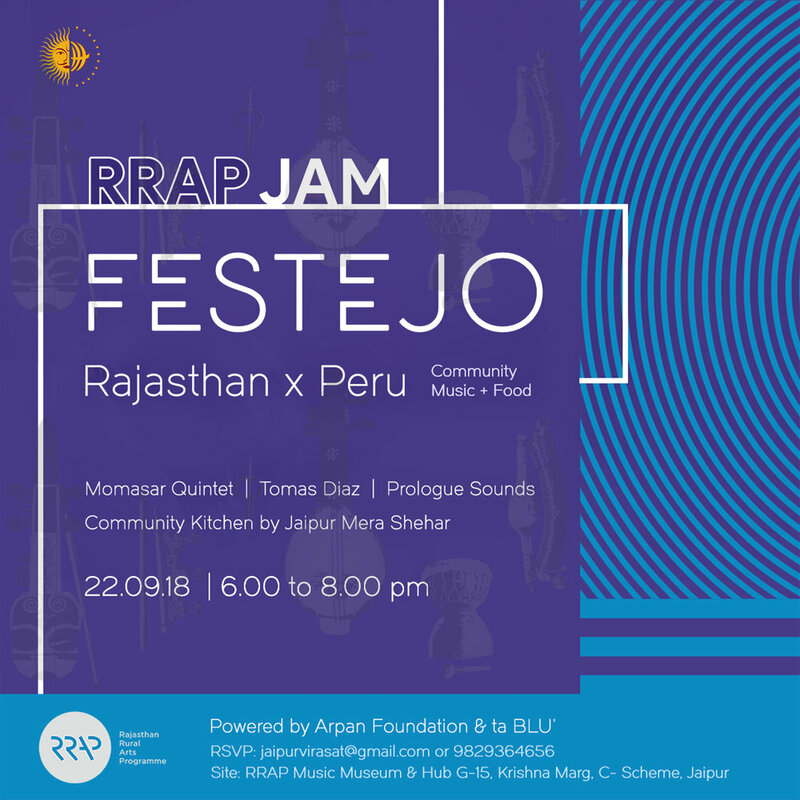 Along with music we have food prepared by Community Kitchen ( a Jaipur Mera Shahar initiative in collaboration with RRAP) for all you to bond over and connect. >Not Ticketed, Pay what you want! Enjoy an evening of music and stories at the RRAP Hub this Friday. In our first "smory". Anthropologist Vinod Joshi will interpret the music of the Langa musicians and explore the politics, history and culture behind the community’s music. Entry is open and free! Introducing RRAP Jam, where folk musicians and locals gather in celebration of music and community in an open jam format. This first jam is conducted by Sitarist and World Musician: Krishna Mohan Bhatt. On popular demand, we are happy to announce folk music workshops for adults! Gazi Khan and Anwar Khan Manganiyar, both widely acclaimed masters, will present a specially curated workshop for adults between the 19th -25th May 2018. The timings will be 4.30-6:00 pm. The workshop will cover morchang, khartal, percussion and folk songs. On popular demand, Jaipur Virasat Foundation is also offering Bhapang intensive and miscellaneous beats for Mother-Child participants. Enjoy a one week intensive where you learn Bhapang and witty poems from Jumma Khan Mewati between 19th - 25th May 201. The timings will be from 8:30 - 11:00 am. Jaipur Virasat Foundation presents RRAP Camp - a series of fun creative summer classes for kids. It's an opportunity to expose children to Rajasthan’s cultural roots and their enduring relevance.